The St. Rose Quilting Bee is back, and they are on their way to Hawaii! They will be learning all about Hawaiian quilting while they tour the island, view quilts and see what inspired the designs. Unfortunately, on their second night, their hostess’s husband Sam is murdered at a luau. Right in front of everyone, with no one aware of it until the police arrive the next morning. Once again, the women use their time stitching to dissect the characters of the people involved and help the police solve the crime. Manu, Lurline’s ex and Makana’s father, a wonderful cook and all around cheerful personality. Then there is Iris, the woman who arranged the trip and Judy, a former St. Rose parishioner who now lives in Hilo and had a brief liaison with the dead man. Who wanted Sam dead? There are secrets and mistaken identities, and the women will have to examine some of their old friends as well as their new ones. Included in the book are some of Annette's family recipes, reminiscent of foods mentioned in the book. Also, the cover illustration is based on an original Hawaiian quilt wall hanging Annette made some years ago; the pattern shows off the plumeria flower. The St. Rose Quilting Bee is back, stitching beautiful quilts while working to solve a neighborhood crime. This time, it is a cold case. Six months before, the quilters’ quiet neighborhood was rocked by a gas explosion and conflagration. Inside the destroyed home were the bodies of parish members Kate Upland and her twin daughters. Because Kenny Upland is missing, he becomes the chief suspect. So, six months later, the Quilting Bee and all of the Senior Guild are concerned when Clare announces that she has seen Kenny and that he saved her life. Determined to prove him innocent of murder, Clare talks Maggie and the others into helping her. As they begin to explore the life of Kate Upland, the Quilting Bee members waver in their feelings about Kenny. And as they begin to ask questions, things begin to happen—another gas explosion, an attempted murder … What have they gotten into? Maggie Browne and the members of the St. Rose Quilting Bee are back, attempting to solve a mystery as they work on their quilts. Sometime Bee member Candy Breckner is at the Palo Verde Care Center to recover from an auto accident; with two broken legs, she cannot manage on her own. Maggie and the Bee decide to visit, taking her a lap quilt they've made especially for her. (see Appendix for pattern) Candy breaks down when she sees them, saying that she's afraid there's an "angel of death" at work in the facility. Dismissing her story as a side-effect of medication, the women begin to have second thoughts when she dies suddenly. Especially when police questioning seems to indicate an unexpected interest in Bee member Louise Lombard, who discovered the body. 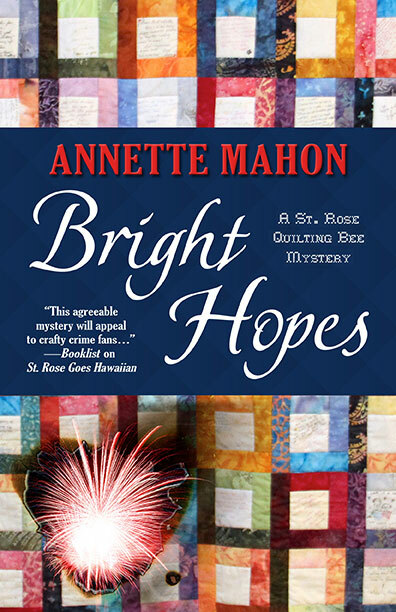 Using their own unique style of investigating, Maggie and the others find the proper mix between quilting and investigative work. But will it be enough to save Louise ... and another potential victim? Can a group of “mature” women actually solve a murder—just by discussing it over the quilt frame? 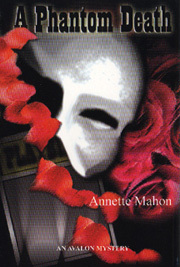 The members of the St. Rose Quilting Bee ask themselves this very question when the lead actor in a touring production of The Phantom of the Opera is found dead in the Scottsdale desert. Maggie Browne knew Jonathan Hunter when he was a child and he played with her boys on their ranch. The murder hits too close to home for her, and she decides to do some sleuthing of her own when the police fail to come up with any viable suspects. As volunteer ushers at the theater, Maggie and fellow quilter Victoria are in a position to find out more about the cast and to deduce possible suspects. There’s the understudy, the distraught girlfriend, the overbearing mother; The Quilting Bee women must consider each one. Will they discover the killer before he or she kills again?